Wine Lovers Earrings with genuine garnet. 14k Gold Filled Wine Bottle and Cork Earrings. Wear these fun versatile earrings at your next wine tasting or wine party. 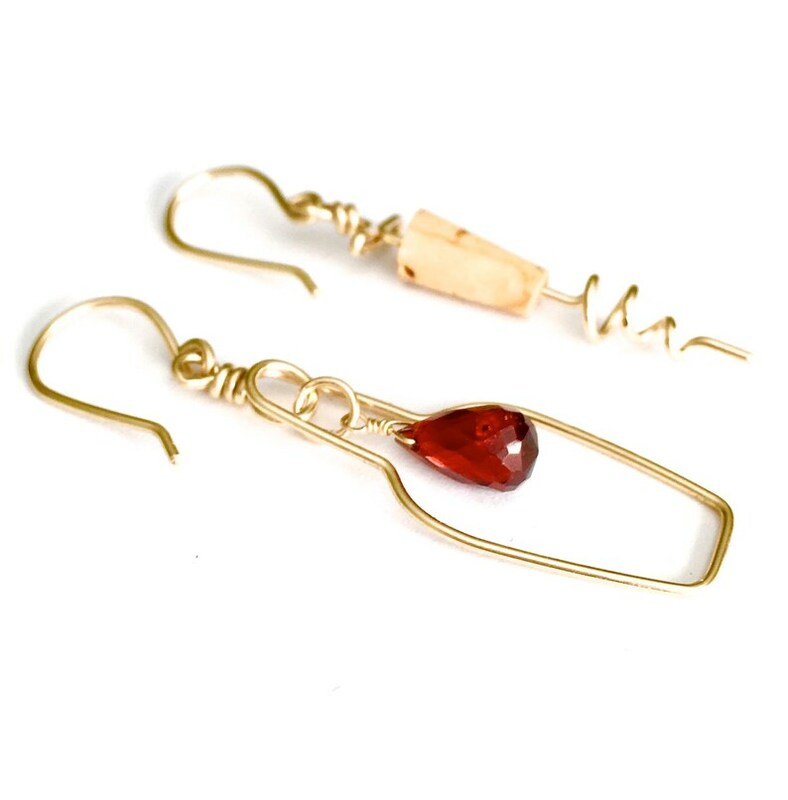 One earring is a silhouette of a wine bottle with deep red garnet as the "drop of red wine" and the other is a tiny real cork caught in a corkscrew. Made expressly for the wine lover. Each earring is different, because, wine lovers are unique that way! Having a wine themed party or girls night? These would make great gifts! They measure about 1 3/4 inches and 1 1/2 inches long respectively. Each pair of earrings is individually hand formed and your earrings may vary slightly from the photo. Care instructions and clear rubber ear backs come with these earrings. What is 14k gold filled wire? It is 14 karat gold coated over alloy metal which may contain brass, nickel, steel and other metals. It is not solid gold, therefore much more affordable, but still equally as beautiful and lustrous. It will last several decades or even a lifetime if cared for and stored properly. Rosé Wine Earrings. Sterling Silver Pink Rosé Wine Bottle and Cork Screw Earrings. Pink Crystal Earrings. Wine Lovers Jewelry. Wine Gift. This was a gift and she loved them. Thank you! Also, I waited until the last minute but I received them within a couple days. Super!! Wine Lovers Earrings. Wine Bottle and Cork Screw Sterling Silver Earrings with Red Grape and real cork. Wine Earrings. Wine Jewelry. Sterling Silver Grape and Cork Screw Earrings. Wine Lovers Earrings with Purple Amethyst Real Cork. Wine Jewelry. Champagne Lovers Earrings. 14k Gold Champagne Bottle and Cork Screw Earrings with Genuine Citrine. Unique Wine Gift.